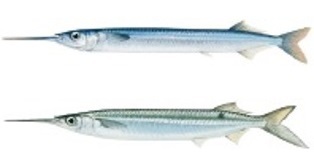 A ban is in place on the catching of southern garfish (top), but fishers can still catch robust garfish (bottom). COCKBURN Sound has been closed to recreational and commercial fishing for southern garfish by the Department of Fisheries to help replenish stocks. South West Bioregions manager Tim Nicholas said a recent stock assessment showed the closure is needed to protect breeding stock until southern garfish numbers rebounded. “The department believes the southern garfish stock issues are being driven by a combination of environmental and fishing pressures,” he said. “While we can’t control the environment, we can adapt our fishing to reduce fishing pressure on the stock and allow the stock to recover and closures are effective in achieving this.” Mr Nicholas said the department would continue to monitor the stock to check the progress of the recovery. Fishers were still permitted to take robust garfish, also known as three-by-two and storm garfish, in the closed area. The ban applies between Lancelin and Myalup.